I ate apple crisp and ice cream for dinner last night. There, I said it. We might as well be honest with each other. I had dessert for dinner. It wasn’t an accident or the result of poor self-control. It was a conscious decision, well thought out and carefully calculated. You see, I subscribe to my own personal balance theory of healthy living. I love food and I’m almost always hungry. Whereas my husband can easily go for six hours or more between meals, I’m hungry again two hours after a big meal. Every two hours or so, my belly sounds the alarm and if the response isn’t immediate, hunger anger ensues. Ask my husband what I’m like during a hunger anger attack. It’s not pretty. Anyway, back to balance. I like to eat and I eat a lot. So, in order to counter the effects of my endless appetite on my waistline, I seek balance. I usually find it through a healthy breakfast and a light lunch. Healthy snack selections, staying active with the kids, and a few runs every week help too. The combination of these behaviors allows me a little leeway with a few indulgent cheesy, delicious dinners and the occasional gooey, sweet treat. But recently, my neat little healthy-living balance equation has been thrown off by the early sunset. I’d had a good routine going for a while. Put the kids to bed at seven, then hit the pavement for while. But, lately it’s nearly dark by the time the kids are in bed. I’ve lost my run time. I need to rework my running routine. In the mean time, I’ve got this little gap in my balance equation, which means I need to be a little more careful on the indulgent side. So, this afternoon, when I pulled the apple crisp out of the oven and gave it a little taste test, I knew I needed a plan. The problem was that the moment that first bite hit my mouth, I knew that a small, reasonably sized portion wasn’t going to satisfy me. No. I know myself all too well. Only a heaping bowl of the hot, cinnamon-doused apples, mounded with crispy nuts and oats, and a huge scoop of vanilla bean ice cream would fit the bill. It wouldn’t matter how much or how little I ate at dinner. 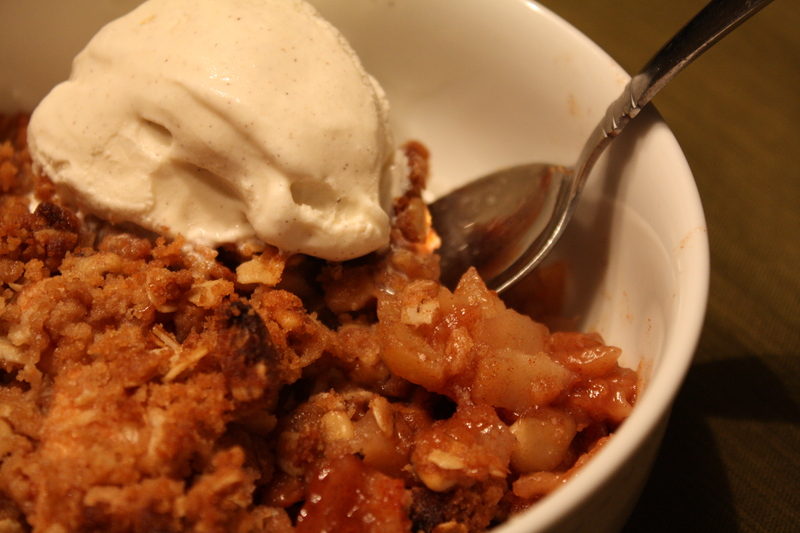 I’d eat a heaping bowl of that apple crisp for dessert, even if it hurt me to do so. A heaping bowl of apple crisp and ice cream, tacked on to the end of an already full day of eating, would most definitely throw off the balance. So, I did the only thing I could think of and substituted the apple crisp for dinner. Balance maintained. Well, sort of. Anyway, that’s my story and I’m sticking with it. Preheat oven to 375 degrees. Lightly butter a 13×9 baking dish. 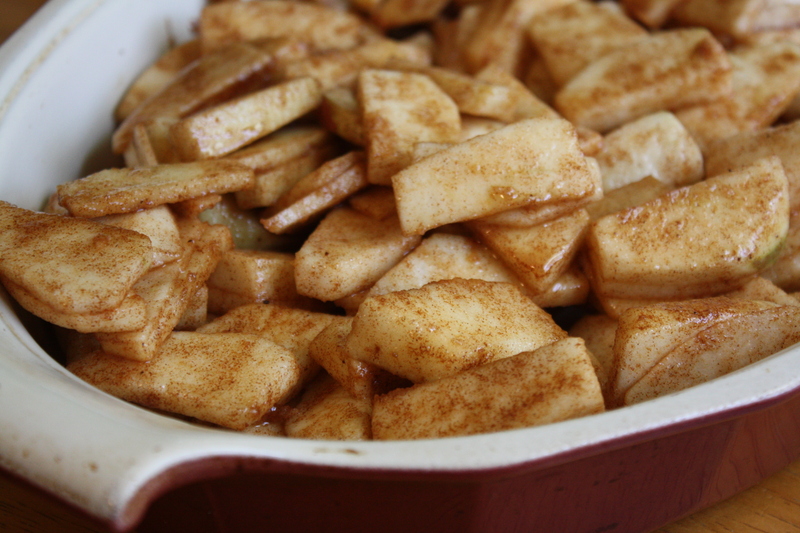 Toss the apples with the sugar, cinnamon, cornstarch, vanilla, and nutmeg. Pour the apples into the prepared baking dish. 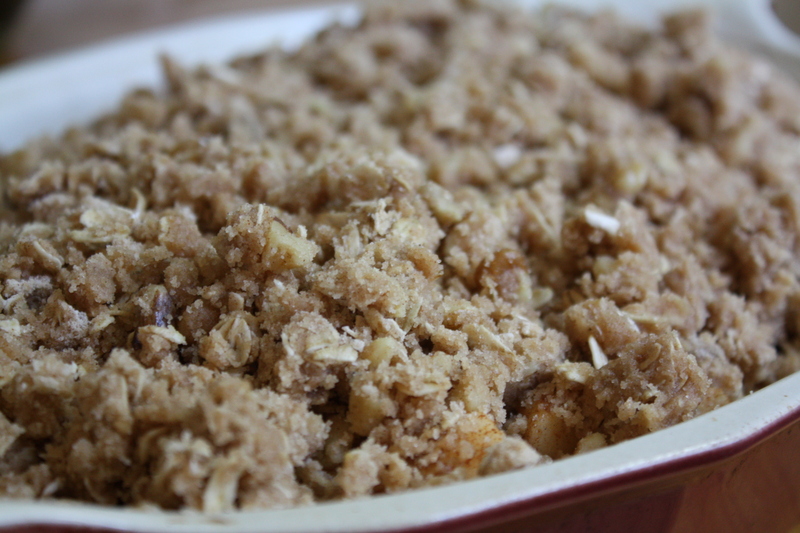 For the topping, mix together the flour, sugar, walnuts, oats, and cinnamon. Pour the melted butter over the mixture and stir until combined. The mixture should appear slightly moist and crumbly. Generously sprinkle the topping over the apples. Bake for 45-50 minutes until golden brown and bubbly. Cool slightly and serve with vanilla ice cream. Posted in Baking, Desserts, Food, Fruit, Ice Cream, Recipes and tagged apple, baking, Cooking, dessert, Eating, Food, food photography, hunger anger, Recipes. Bookmark the permalink. This one made me laugh out loud. I guess it hit to close to home. After all, we are of the same gene pool!! 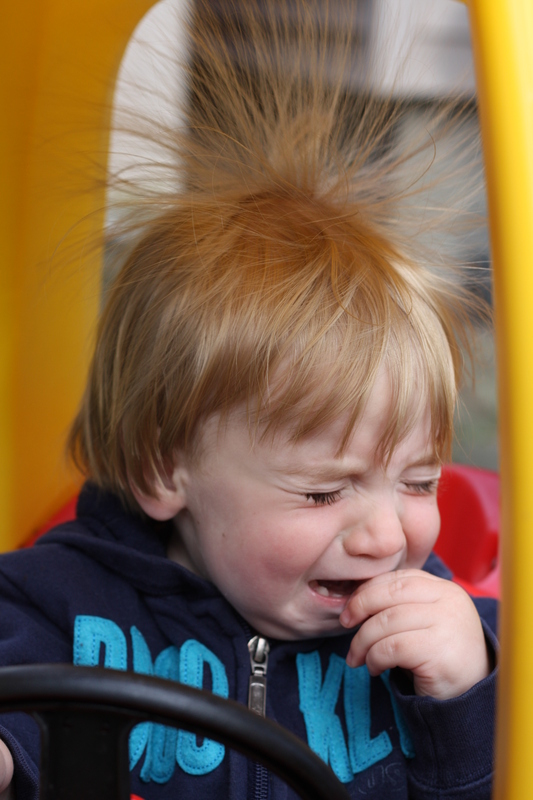 My favorite part is the picture of Lucas, hair standing on end, in the throes of his hunger anger. Been there, done that. LOL Well written, Amy. Beautifully photographed. Can’t wait to try this one!! I love this post! I am glad to know that I am not the only one who has room for a yummy dessert (and even looks forward to it) after eating a very filling dinner. Maybe next time I’ll opt for dessert for dinner too! 🙂 Also, I am super excited to try this apple crisp recipe (and other apple recipes that I am hoping are coming in the future!). We will be doing a few apple picking trips over the next month or so and I am always looking for new recipes! 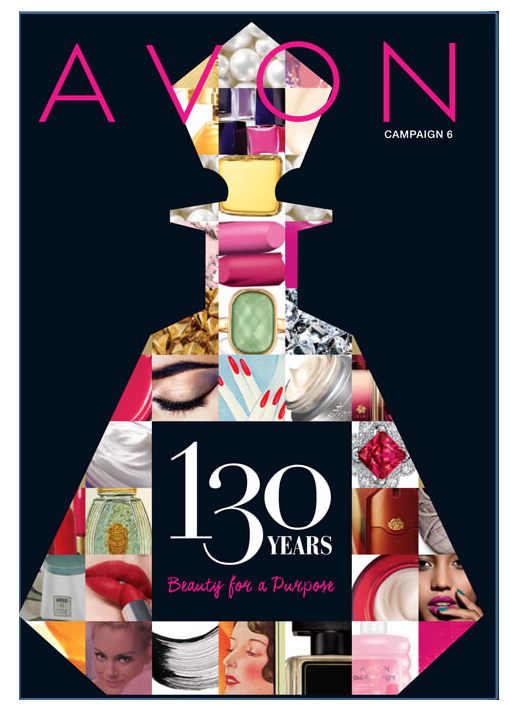 Love the blog – keep the yummy recipes coming!!! This is hilarious! I like your balance plan, and substituting dinner with that fantastic dessert makes complete sense. This makes me very excited for fall! 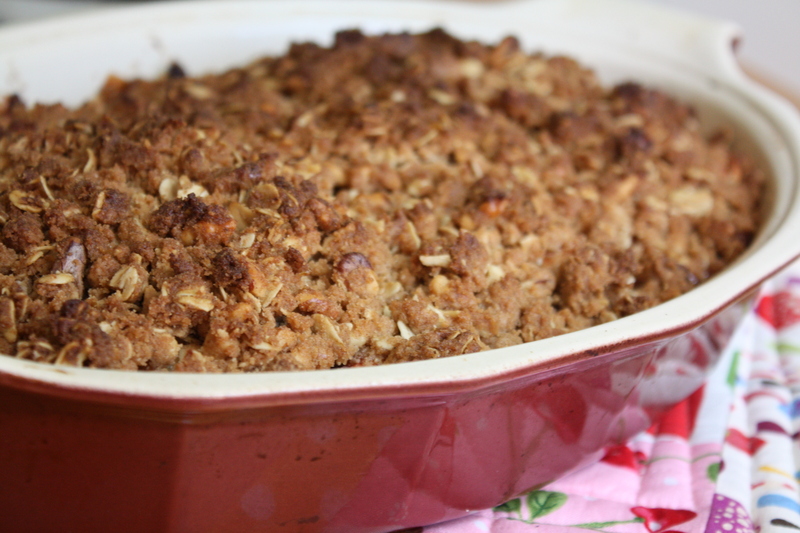 Oh yippee, I am not the only one who has to eat every couple of hours then 😀 and I fully agree and support that your balance is being maintained – perfect logic in what you are saying AND your Apple Walnut Crisp looks and sounds fabulous. Thanks for the uplifting read.